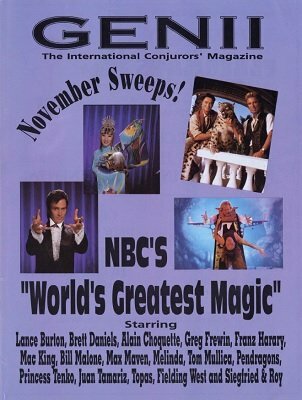 NBC Presents "The World's Greatest Magic"
Cheating at Blackjack - "Dustin D. Marks"
World's Greatest Magic Wins the Ratings!! Hey Kids! Can You Solve This Fun Magic Crossword Puzzle? The B.J. Hickman Magic Show - Video III "The Birthday Party"
It's a Magic Duo! It's a Comedy Duo! Kineti-Key Jr. - Viking Magic Co. The Bat - Chazpro Magic Co.
Shadda Madda Goola, Beef Stewla, Lolla-Paloola! Nobody Sleeps When I Work! The Closer You Watch Me, The Quicker You'll Find Out How Little You Know! Stand Up Straight, Boy. He's All Right. He's All Right. The Quick or the Dead - William W. Larsen, Sr.
Materialization of a Rose - William W. Larsen, Sr. The Three Slate Test - William W. Larsen, Sr. The Medium Speaks - William W. Larsen, Sr.
From the Notebook - William W. Larsen, Sr.
Can We Learn Anything from Video Tapes?